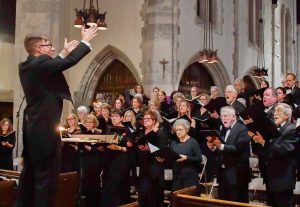 The Tower Chorale is a 90-voice community chorus comprised of amateur and professional singers, including former members of the Chicago Symphony Chorus, Grant Park Symphony Chorus, Light Opera Works, Chicago Opera Theater and various community theater and music organizations. Many church choirs are represented. Known for musical diversity, this non-profit organization has been one of the premier music groups in Chicago’s western suburbs since 1986. Our seasons consist of three concerts per year; December, March, and May. Music ranges from the classics of past centuries (Bach, Haydn, Mozart, Beethoven, etc.) to modern and ethnic pieces. 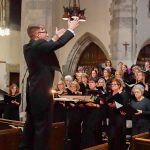 Sung by up to 100 voices plus orchestra or ensembles of brass, timpani, and organ, the performances have led the Tower Chorale to become recognized as the premier vocal musical group in Chicago’s western suburbs.